All the people perceived the thunderings, the lightnings, the sound of the trumpet, and the mountain smoking. When the people saw it, they trembled, and stayed at a distance. They said to Moses, "Speak with us yourself, and we will listen; but do not let God speak with us, lest we die." Moses said to the people, "Do not be afraid, for God has come to test you, and that his fear may be before you, that you won't sin." The people stayed at a distance, and Moses drew near to the thick darkness where God was. Exodus 20:18-21 NHEB. My friend, you are one heartbeat away from eternity. One last breath separates you from the Final Judgment. Do you know God personally? Are his commands on your heart? It's time to get serious about your faith. You have an opportunity to be considered "great" in God's eyes. The secret in being a great human is found in this study. Jesus said, "Anyone who obeys God's laws and teaches them will be called great in the Kingdom of Heaven" (Matthew 5:19). It's time to get serious, and you chose the right place to learn lots of critical information about God. The following list of the Ten Commandments includes free, deep Bible study lessons for every commandment. Study these and you won't be left standing foolishly ignorant in front of Christ the Judge on your personal Judgment Day. An important expansive look at the commandment. A fruit of the Spirit response to the commandment. The popular "Grasp This!" section for personal application. The secret and ONLY way to perfectly OBEY the commandment. Thought-provoking 10 Commandment Bible Study Questions. Finally, you'll receive additional Bible verses for the lesson, and an inspirational closing prayer. Your FREE printable list of the 10 Commandments is found at the end of all 17 lessons. Don't miss the "Genius" video at the bottom of this page. It's amazing. Get comfortable and thoroughly read this page and watch the video. Afterwards, choose a study and wave good-bye to ignorance of God's Law. We'll begin our in-depth Bible study on the Ten Commandments with an introductory look at the reasons behind God's Law, and why we need to pay attention to each and every one of them. 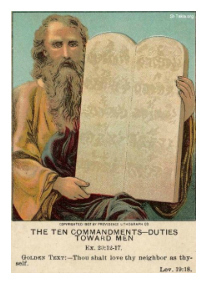 Click here: What Are the Ten Commandments? Bible study lesson #5.11. God printed the first four Laws on a tablet of stone. These are written so that we know how to act towards God. They are listed in order of importance, but yet the Bible Ten Commandments are a single unit. I. The First Commandment: "I am the Lord your God... You shall have no other gods before me." Exodus 20:3 NHEB. Click: 1st Commandment, Bible study lesson #5.01. II. The Second Commandment: "I am the Lord your God... You shall not make for yourselves an idol, nor any image of anything that is in the heavens above, or that is in the earth beneath, or that is in the water under the earth: you shall not bow yourself down to them, nor serve them, for I, the Lord your God, am a jealous God, visiting the iniquity of the fathers on the children, on the third and on the fourth generation of those who hate me, and showing loving kindness to thousands of those who love me and keep my commandments." Exodus 20:4-6 NHEB. Click: 2nd Commandment, Bible study lesson #5.02. III. The Third Commandment: "I am the Lord your God... You shall not take the name of the Lord your God in vain, for the Lord will not hold him guiltless who takes his name in vain." Exodus 20:7 NHEB. Click: 3rd Commandment, Bible study lesson #5.03. IV. The Fourth Commandment: "I am the Lord your God... Remember the Sabbath day, to keep it holy. You shall labor six days, and do all your work, but the seventh day is a Sabbath to the Lord your God. You shall not do any work in it, you, nor your son, nor your daughter, your male servant, nor your female servant, nor your livestock, nor your stranger who is within your gates; for in six days the Lord made heaven and earth, the sea, and all that is in them, and rested the seventh day; therefore the Lord blessed the Sabbath day, and made it holy." Exodus 20:8-11 NHEB. Click: 4th Commandment, Bible study lesson #5.04. God printed the final six of the Bible Ten Commandments on the second stone tablet. They're written so that we know how to act towards other people. These are God's eternal laws for which we'll be held accountable. V. The Fifth Commandment: "I am the Lord your God... Honor your father and your mother, that your days may be long in the land which the Lord your God gives you." Exodus 20:12 NHEB. Click: 5th Commandment, Bible study lesson #5.05. VI. The Sixth Commandment: "I am the Lord your God... You shall not murder." Exodus 20:13 NHEB. Click: 6th Commandment, Bible study lesson #5.06. VII. The Seventh Commandment: "I am the Lord your God... You shall not commit adultery." Exodus 20:14 NHEB. Click: 7th Commandment, Bible study lesson #5.07. VIII. The Eighth Commandment: "I am the Lord your God... You shall not steal." Exodus 20:15 NHEB. Click: 8th Commandment, Bible study lesson #5.08. XI. The Ninth Commandment: "I am the Lord your God... You shall not give false testimony against your neighbor." Exodus 20:16 NHEB. Click: 9th Commandment, Bible study lesson #5.09. X. The Tenth Commandment: "I am the Lord your God... You shall not covet your neighbor's house. You shall not covet your neighbor's wife, nor his male servant, nor his female servant, nor his ox, nor his donkey, nor anything that is your neighbor's." Exodus 20:17 NHEB. Click: 10th Commandment, Bible study lesson #5.10. Jesus' arrival brought a new commandment, actually the most important one: The Greatest Commandment. The Golden Rule was also set alongside the first. XI. Jesus' Commandments: "Teacher, which is the greatest commandment in the law?" He said to him, "'You shall love the Lord your God with all your heart, with all your soul, and with all your mind.' This is the great and first commandment. A second likewise is this, 'You shall love your neighbor as yourself.' The whole Law and the Prophets depend on these two commandments." Matthew 22:36-40 NHEB. Click: Jesus' Commandment, Bible study lesson #5.14. Jesus' commandments were exercised in the story of the (click): Rich Young Ruler, Bible study lesson #5.17. NEW! 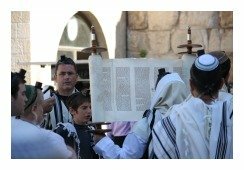 Jewish Ten Commandments: Discover the reasons for the Ten Commandments here, and for whom God intended them. The Old and New Covenants are a focal point of this study. Click: Jewish Ten Commandments, Bible study lesson #5.12. 613 Commandments: The thought of 613 commandments makes one shutter, but this is a crucial Bible study lesson in understanding the unity between the Law & Gospel. Click: 613 Commandments, Bible study lesson #5.13. Click: Catholic Ten Commandments, Bible study lesson #5.15. Click: Ten Commandments for Children, Bible study lesson #5.16. This shortened list of God's Law is included with this serious warning: A superficial knowledge of the 10 Commandments can be hazardous to your spiritual health. God expects you to fully read, study, and apply the depths of his Law to your life. Studying the Law without studying Christ's teachings is spiritual failure. I. "You shall have no other gods before Me." Ex. 20:3. II. "You shall not make or worship false idols." Ex. 20:4-6. III. "You shall not take the name of the Lord your God in vain." Ex. 20:7. IV. "Remember the Sabbath day and keep it holy." Ex. 20:8-11. V. "Honor your father and your mother." Ex. 20:12. VI. "You shall not murder." Ex. 20:13. VII. "You shall not commit adultery." Ex. 20:14. VIII. "You shall not steal." Ex. 20:15. IX. "You shall not give false testimony." Ex. 20:16. X. "You shall not covet." Ex. 20:17. Both full and shortened versions are included on the printable list of the 10 commandments. Special Note: I'm grateful to Big Book Media & Free Bible Images, stock.xchng, Morgue Files, and Stock Photos For Free for the use of their photos for our List of the Ten Commandments.